There are few things more heartbreaking than when a beloved parrot accidentally escapes. Barbara Heidenreich of Good Bird Inc and Robin Shewokis of The Leather Elves were inspired to make this DVD by the thousands of pleas from parrot owners desperately seeking help to recapture a lost bird. This DVD features detailed instructions to help you get your lost parrot back, as well as useful tools such as lost bird flyers, lists of people to contact and a variety of parrot calls. This DVD is a must for any parrot owner. Be prepared. 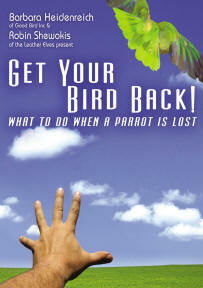 Learn in advance how to prevent the heartache so many have experienced when a parrot is lost. You CAN get your bird back and this DVD can help. n Disc 1 includes a 27 minute instructional video filmed in high definition. n Disc 2 includes Lost Bird Flyers for over 50 species, bird calls for over 30 species, notification lists and preparation checklists. Click here for more information on the first DVD (Parrot Behavior and Training) in this Good Bird series. Be sure to check out the publications by Barbara Heidenreich: Good Bird and Problem Solver! For more Barbara Heidenreich (Good Bird, Inc.) including published articles ... click here! PLEASE REMEMBER COPYRIGHT© LAW DICTATES THAT WE CAN NOT TAKE BACK OPENED CDs/DVDs, ONCE YOU HAVE OPENED THEM, THEY BELONG TO YOU! WE WILL REPLACE DEFECTIVE CDs/DVDs WITH SAME MERCHANDISE ONLY (AND IT WILL BE OPENED, TESTED AND RETURNED TO YOU)!